We would like to remember our friend Richard Hand. His duo with Tom Dupre was an inspiration to us both. 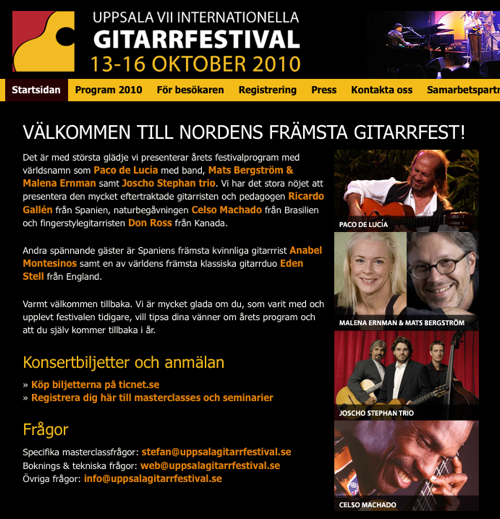 The Eden Stell Guitar Duo will be joining the line-up of guitar wizards at Sweden’s Uppsala International Guitar Festival 13-16 October. 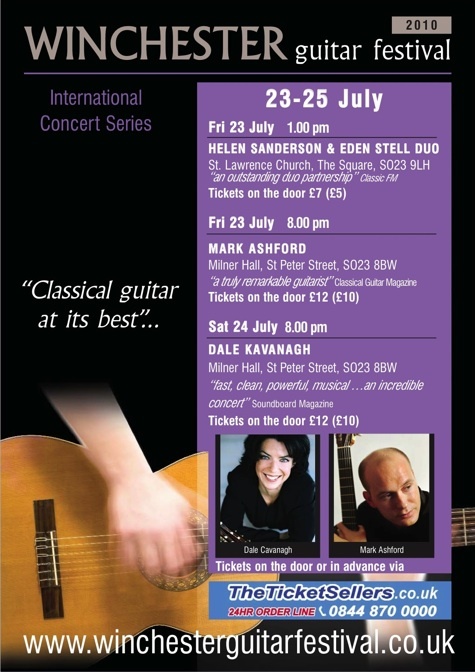 The Winchester Guitar Festival 23-25 July 2010 is once again opening its doors for a weekend of concerts, ensembles and workshops. This year’s WGF10 concert line-up includes Mark Ashford (UK) and Dale Kavanagh (Canada), Helen Sanderson (UK) and the Eden Stell Guitar Duo – us! All of the above will be joined by Frank Gerstmeier (Germany) who will be teaching on the WGF10 Festival. Please see details for course and the concert series at www.winchesterguitarfestival.co.uk where you can book tickets online. We were just sent this great YouTube movie of Guitare Alla Grande 2009, Ottawa. This is a wonderful festival organised by the Canadian Guitar Quartet and I’m sure many others. Full write-up by Louis Trepanier on the CGQ facebook site. 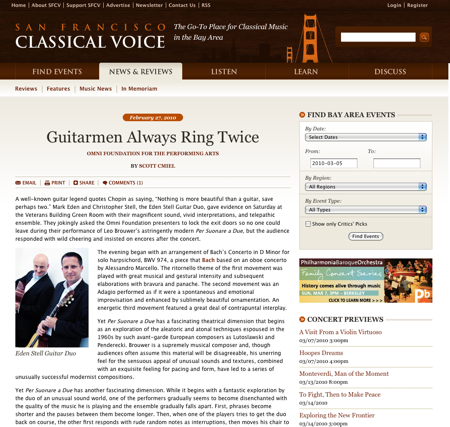 The following review of the Eden Stell Guitar Duo concert for the Omni Guitar Series is by Scott Cmiel, chair of the guitar and musicianship departments in the preparatory division of the San Francisco Conservatory of Music, and reviewer for the San Francisco Classical Voice.